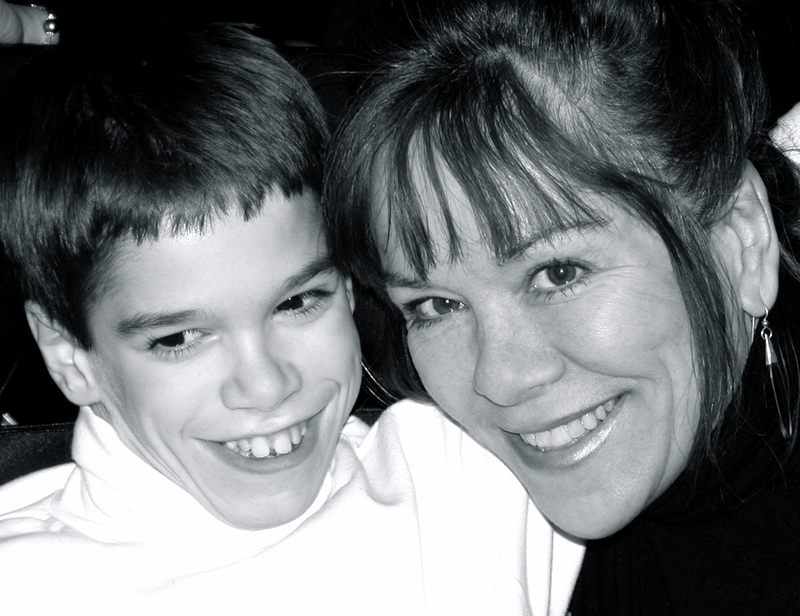 Join Gail Ford Williamson of Down Syndrome in Arts & Media (DSiAM) tomorrow on the Sheena Metal Experience (Live LA) LIVE from 5 to 6 PM PST (9 p.m. EST). Gail will be discussing the Entertainment Weekly article about actors with Down syndrome. Please listen and tell your friends with children with DS to listen. You can also call in and add your voice. Click here and click on LISTEN LIVE or call in at 323-203-0815. Open for important discussion and greater awareness. Courtesy images used with permission. Thanks, in part, to interest in Gabby Giffords' remarkable recovery from injury to the brain, here's a terrific piece about the power of music therapy to heal a wide range of disabilities and brain injuries. During the past decade, we've witnessed and celebrated the magic of music therapy many times at RicStar's Camp. It's a remarkable profession that changes lives. This piece helps most better understand how/why. I only wish they'd included our camp. Perhaps a followup in June? Watch The Healing Power of Music here. Special Reminder: Registration for ALL campers interested in attending RicStar's Camp opens tomorrow! Scholarships are available, as is housing for a fee. Thinking of the students in Ohio and wondering how we ever got to this point. Hearts again broken. Innocence stolen. No easy answers. As a writer, I don't usually endorse censorship, but I don't promote/use ANY hate speech either. That's what the word retarded represents to millions. Have you ever heard anyone use this word to build someone up?? Like other hate speech we loudly denounce, the r-word reinforces painful, outdated and limiting stereotypes. Because of my son, who was wrongly judged to be intellectually challenged due to wheelchair use and limited motor skills/speech, I know firsthand the daily tough judgement faced by 200 million people plus because of ignorance and insensitivity fueled by the continued casual use of this word. I choose to show Respect to others instead. What about you? Banner courtesy of Special Olympics. Used with permission. I can't believe that RicStar's Camp and the Sprout Film Festival are both celebrating ten years of great special needs efforts!! We are. We celebrate music; they celebrate films. We both focus on special needs & ability. Since I've already highlighted my terrific camp, here's the annual info on the Sprout Film Festival from its executive director, Anthony Di Salvo. This is one exciting yearly event I hope to attend. The tenth annual Sprout Film Festival will be showcasing 53 films related to the field of intellectual and developmental disabilities from 13 countries. The festival will take place Friday April 27 – Sunday April 29, 2012 in NYC at The Metropolitan Museum of Art. You can visit their site for the schedule of films and trailers. Cared Witless: an 11-minute narrative from the UK can be found here. Distinctively: a 4-minute documentary from the US can be found here. Beyond Borders: a 20-minute documentary from Belgium can be found here. Finally, you can see the upcoming schedule of our Sprout Touring Film Festival here. My name is Lisa Greig and my husband's name is David. We live in Mississippi. Our 8-year-old son's name is also David. He has cerebral palsy and loves being outdoors. 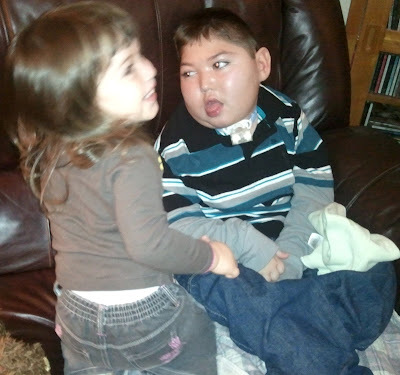 David also has a little sister, Cecelia, who adores him and loves to shares kisses with him. She's twenty months old. My best advice to others parents of children with special needs? Be patient with yourself, your family, and your child/children. Love today like there is no tommorow. Don't sweat the small stuff. Find someone you can talk to about your parenting challenges and doctors you can trust. 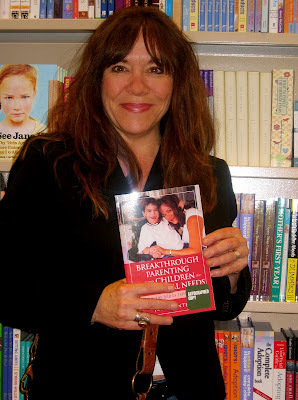 Finally, read Breakthrough Parenting for Children with Special Needs: Raising the Bar of Expectations. (Note: I didn't pay Lisa to say this, but it is good advice, so I'm leaving it in!). I think a great attitude helps, too, and Lisa seems to have that in spades. Lives worth living. Focused on ability. If you'd like to see your family featured here, e-mail me at JudyWinter.com. All photos courtesy of Lisa Greig. Used with permission. But I loved (love), loved, loved Robin Roberts and all the pretty dresses. Final reminder to returning campers/families and potential new campers. 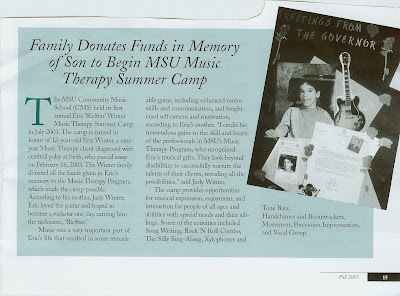 Registration for the 10th annual Eric 'RicStar' Winter Music Therapy Camp at Michigan State University (aka RicStar's Camp) will open to ALL interested campers this Thursday, March 1st. Camp will fill up, so act quickly. FYI: The long wait list rarely, if ever, moves. Today, I'm giving big kudos to Entertainment Weekly and writer Lynette Rice for this week's excellent feature on working actors with Down syndrome, including Lauren Potter of Glee, who has done much to enhance the awareness and understanding of actors with special needs, and become a powerful advocate in the process. I could sum up the specifics of the piece, but you can read it for yourself. I'd rather use this space to explain why I believe the article deserves our attention and discussion at all. But BRAVO to all the actors profiled in the piece. As a writer, I've been covering special needs parenting issues for twenty years, first, as a contributing newspaper columnist and feature writer, then as an author, blogger and national speaker. 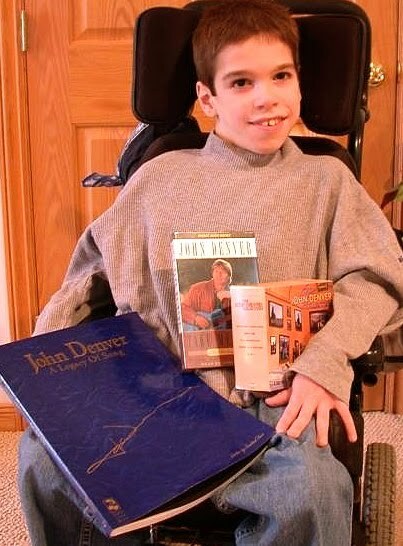 All efforts have been fueled by the love for my son, Eric, a musically talented child who was diagnosed at birth with cerebral palsy and passed away far too soon in 2003 at age 12. Everything I do on behalf of special needs awareness is designed to honor his legacy and amazing life, and to teach what we'd painstakingly learned firsthand. When I was raising my son, there was no Internet, no social networking, no 'real housewives' and other reality television, no mommy bloggers, Jersey was the shore, and there were few if any resources that highlighted kids with special needs as having value and potential. Most did not understand how such children could be worth our parenting effort, or worth the money required for needed services or an education. Far too many people still view having such children in a family as a curse or shame. They could not be more wrong. In those early years, it was rare that the challenges and successes of millions of kids with special needs were ever covered in the media. Their successes were left out of our history books and not discussed in our classrooms. Still aren't. When they were addressed in the media, the reporter's words tended to further fuel outdated and painful stereotypes. Harsh terminology, including handicapped, crippled, crazy, retard and spastic, gimp, suffering, wheelchair bound and spec-ed kids were terms most often associated with our children, and the media, including Hollywood, was more often than not, guilty of perpetuating those outdated perceptions. That has made the achievements of our children, and the spirited, 24/7 efforts of their families, especially tough to realize or celebrate. Shamefully, that is still too often the case today. 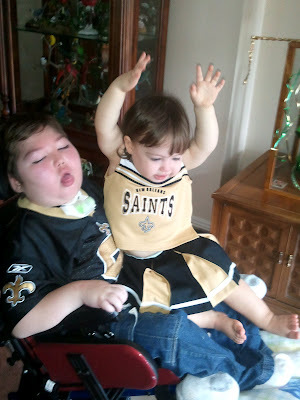 But in 2012, I finally perceive a positive shift in coverage of the special needs population by the media. I sense a greater understanding and sensitivity to the subject matter and the reality of the human rights struggle that it represents, one not unlike other minorities have faced. I sense a critical shift to a crucial awareness that these individuals are human beings, too, not alive to be the target of sick jokes, crude storylines and cruel put downs, or denied basic dignity and freedoms others take for granted. They are not to be defined solely by disability. They are not team mascots. They deserve big dreams, too. 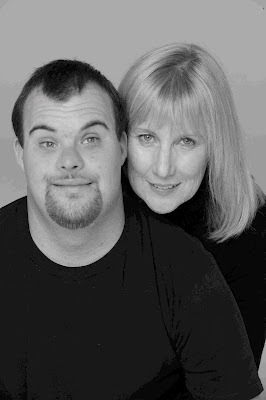 My hat is off to Gail Williamson, formerly of California's Media Access Office and the Down Syndrome Assocation of Los Angeles (DSALA), and now with Down Syndrome in Arts & Media (DSiAM), which helps actors with Down syndrome and other intellectual disabilities find work. No one has worked harder to help these actors realize their creative dreams, a passionate mission born of the love for her own son, Blair, a successful working actor with DS. Gail and I are mommy lions who met early on in my parenting journey. We've fueled each other's tireless pit-bull advocacy for years, when few else cared, believed in what was possible, or chose to remain silent. I'm proud to call her my friend. I'm even prouder that my own son, who had a physical disability, taught me to never stop trying to make his life and that of other kids with disabilities better, and in the process, try to right some big societal wrongs, including blatant descrimination. It's a passionate mission I continue today, nine years after his death. To say it has been difficult would be an enormous understatement. Creating needed change for those with special needs has been the toughest challenge I've ever taken on, even tougher than raising my beloved son. That harsh, infuriating reality still fuels me on. I'm not nearly as naive as I once was, and that has empowered me to fight successfully for change. 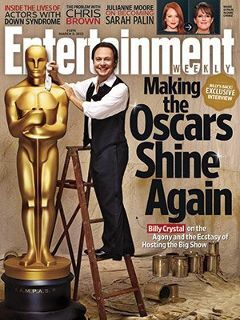 This EW article represents huge progress in perceptions and reporting of actors with disabilities. But it is only a beginning. We need to recognize their challenges for what they are, one part of a larger human rights struggle. Many people today still refuse to see that all disabilities are worthy of our discussion and support and accurate portrayal and reporting, not just one. We have far to go. Still, this is a start. The good news is that as a writer and activist, I can no longer keep up with all the media coverage of special needs, and many other voices of determined, loving parents have today been loudly added to my own. My work is not nearly as isolating as it once was. My son would be proud. Finally, we are humanizing this population and raising our spirited voices together. Long overdue. 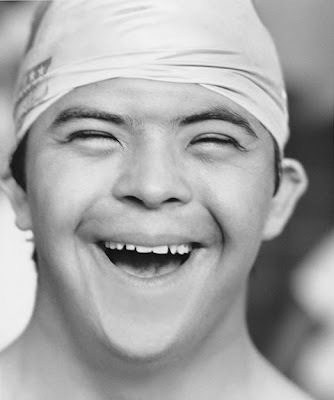 Read Inside the Lives of Actors with Down Syndrome here, and let ET know you approve of what they've done, especially during this week of the Oscars. Huge progress. Lives worth living. Focused on ability. Images courtesy of Gail Williamson at DSiAM & Richard Redlin. Used with permission. For more information on registering your child with DSiAM, Williamson asks that you click here. Actors in group shot: Back L-R, Luke Zimmerman SECRET LIFE OF AN AMERICAN TEENAGER, Jamie Brewer AMERICAN HORROR STORY, Robin Trocki GLEE, Blair Williamson CSI, ER, NIP/TUCK, SCRUBS, Luke Spinnelli GLEE. 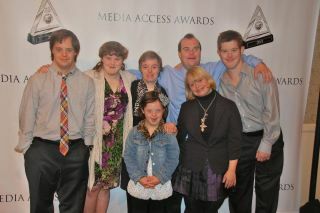 Front L-R Katelyn Reed AMERICAN HORROR STORY, Lauren Potter GLEE. Top shot of Gail Williamson of DSiAM, with son, Blair, an actor. Thanks SpecialNeeds.com for your request to print an excerpt my book about what is for many special needs families an unnerving subject-- staring. Read Dealing with Staring here, and watch for more of my words on that terrific resource. Special Needs Media Alert! -Sarah Gordy, Down Syndrome & A Role on Upstairs Downstairs. Established actress, Sarah Gordy, has nabbed a key role on the BBC's Upstairs Downstairs. The role is considered ground breaking because the character has Down syndrome, as does Sarah. The series returns to BBC tonight and will air on PBS stations later this year. Great therapy dog and best writer's dog ever. Shelter dogs rock! This one is changing lives, including mine. Please, adopt. I'm sure glad I did. So is Jack. Okay, I'm a day late on this TGIF message, but that's okay because it's worth waiting for. 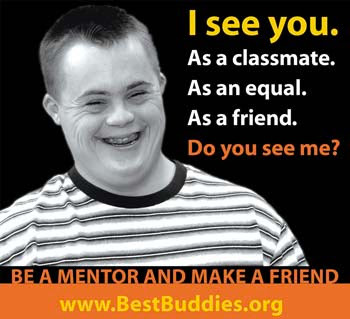 I just LOVE this photo and message from Special Olympics. But then I love everything they do. This one made me smile. Hope it does the same for you. What a beautiful face. Enjoy!! "Celebrating the best feeling in the world – joy! Happy Friday!" The following CBS report is especially exciting because early diagnosis and intervention services are critical for children with autism. 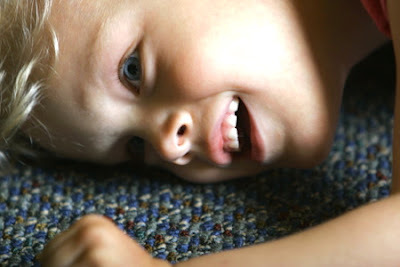 Watch Brain Scans Detect Early Signs of Autism, here. Submitted head shots of two of our favorite RicStar Camp participants and now hope they get the nod for moving forward in casting of a special needs role for the new Kate Winslet movie Labor Day. Both guys would be terrific, and they've got great moms, too. Fingers crossed for Kurtis and Evan! I'll always treasure this amazing likeness of my son, Eric, that was created as a gift for us after he died by his talented young friend, Cassie. Special Needs Kudos to DJ Svoboda on Imagifriends Book Cover! Congratulations to my talented artist friend, D. J. Svoboda. I've blogged about Daniel before, but I'm pleased today to announce that one of his whimsical Imagifriends drawings (which I love!) 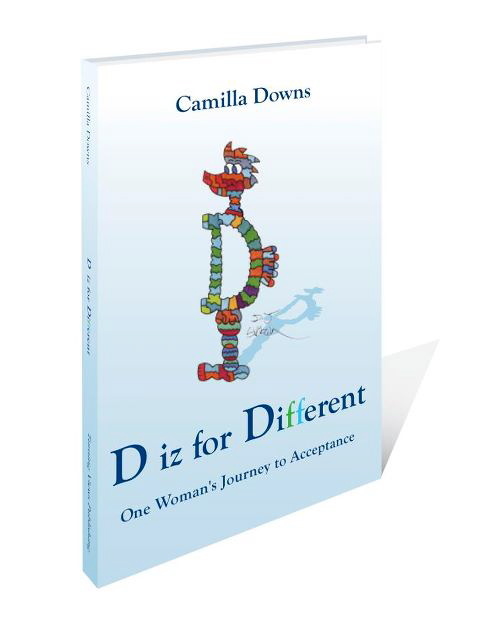 has made the cover of the new book D iz for Different: One Woman's Journey to Acceptance by Camilla Downs. You may recall that Daniel is a successful working artist who happens to have autism. Check out Daniel's work, here. 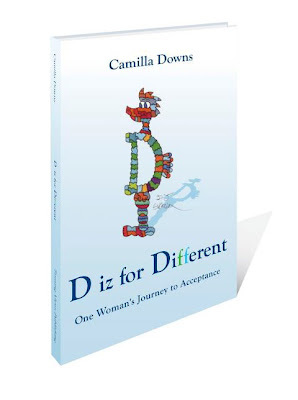 Congrats to the author, Camilla Downs, too! She is a special needs life coach. Find out more about her work, here. A benefit of aging. The older I get, the less need I have to be competitive, loud or right. But I'm not too keen on the gravity games. I'm proud that my community made the CBS Evening News last night because of the on-going efforts of one individual to promote random acts of kindness to strangers. Bob Hoffman's altruistic efforts began after a driver in East Lansing, Michigan cut him off in traffic. The decision he made in that moment to respond in kindness instead of rage, and include others in his efforts, has since caught fire in a mid-Michigan community filled with big hearts. Watch the spot from On the Road with Steve Hartman at the link below, and then think of ways you can impact your own communities. A kinder, gentler world is exactly what we need, and it begins with each one of us. One person can indeed make a difference. Watch Michigan Man Encourages Others to Pass it Forward here. Big kudos to Bob Hoffman. Don't you just love good news? I sure do. RicStar's Camp photo by Erik Taylor Photography 2012. My friend, Gail Williamson, formerly with the Down Syndrome Association of Los Angeles (DSALA), has a new venture called Down Syndrome Arts & Media (D.S. I AM) to help employ actors with Down syndrome and other intellectual disabilities, territory she knows well. For casting purposes, the Facebook page includes photo albums of actors with DS and other intellectual disabilities according to geographic location, age and gender. Interested parties can then contact Gail directly to pursue casting/hiring. 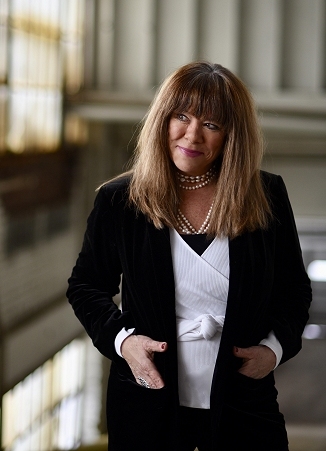 No one has done more to help actors with special needs get the professional gigs they deserve, while creating greater awareness of the population in the entertainment industry, than Gail has. Congrats, Gail Williamson on this exciting new venture. 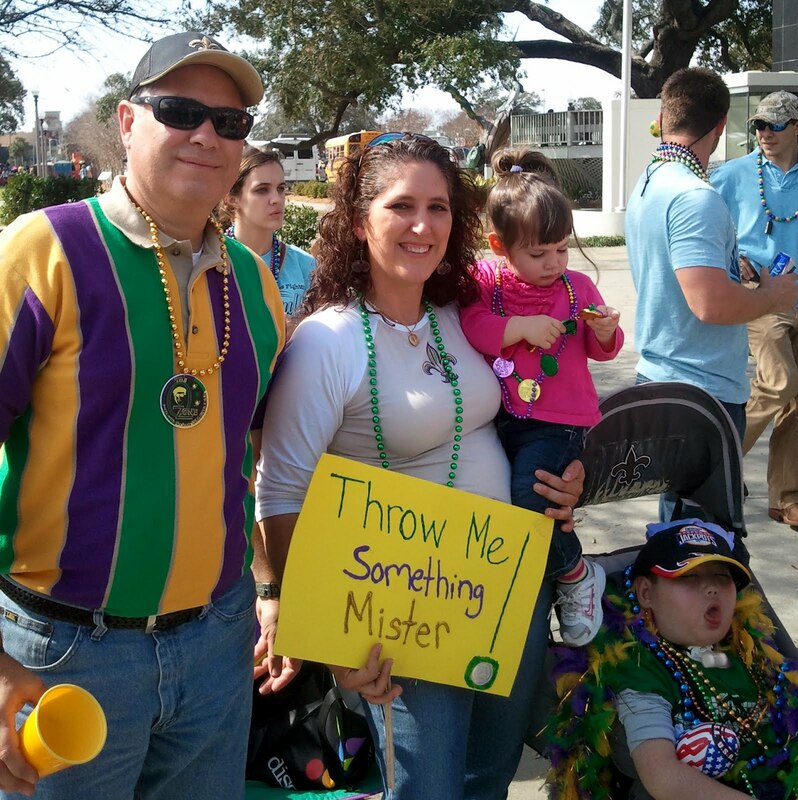 Find the list for families of children with special needs, and others, here. Just in case you thought you were alone in this dicey parenting journey. 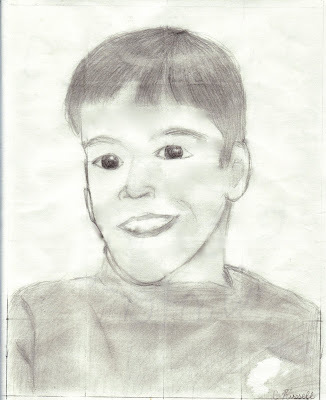 Nine years after the death of my son, Eric, a few things I know for sure. Eric had the best dad and big sister any child could hope for, and he knew he was deeply loved and valued by many. A parent never fully gets over the death of a child. But they can again live life fully. Time alone heals nothing. What we do with that time, does. Parenting a child is a sacred responsibility, and hard work. A single act of kindness is never wasted. It can change someone's day, or his/her life. One person can make a big difference and create needed change in the world, including a seemingly 'imperfect child,' who remains my greatest life teacher. Your music lives on, RicStar, always will. Info on RicStar's Camp, which honors Eric's remarkable life and legacy, here. Jack loves everybody, and he's a canine cutie patootie. But he's still not getting any chocolate. Family members, coaches and leaders of Special Olympics and Best Buddies International from forty states will converge on Washington, D. C. on February 8th for the annual Capitol Hill Day to help ensure that the needs of and equality of people with disabilities are at the forefront of important upcoming political discussions. 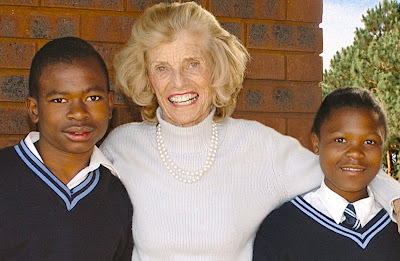 The groups will also be advocating for passage of the Eunice Kennedy Shriver Act of 2012 to honor the founder of Special Olympics, who died in 2009. The contingency will meet on February 8th at 5:30 p.m. E.T. 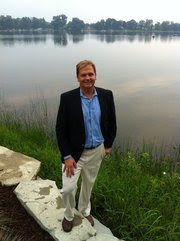 at the Capitol Reflecting Pool in Washington, D.C. I will go with them in spirit, and continue to advocate on their behalf. Love the show, but what was up with all the profanity on The Voice last night? Love this! Leave it to marketing/sporting-gear genius Nike to create a shoe for athletes with prosthetic limbs. It's called the Nike Sole and Nike worked with international marathoner, Sarah Reinertsen, first woman to finish the grueling Hawaii Ironman with a prosthetic limb, to make it happen. Find out more about this cool creation here. Good reflection by a professional without a disability speaking to a student crowd filled with them. I like her honesty, too, but not the employment rate among those with disabilities, which is just 17.9 percent vs 63.7 percent for the general population. Read A Chance to See Disabilities as Assets by Peggy Klaus here. Powerful story in Sunday's New York Times about one service dog's success reaching a seriously disconnected and raging child with Fetal alcohol syndrome (FAS). The piece is a reminder of the challenges of hidden disabilities in foreign adoptions (and U.S.), the devastating effects of the deadly mix of alcohol and pregnancy worldwide, one mom's determination to reach her son, and the unwavering spirit of canines who love and perform unconditionally. Makes me even prouder of the work that my dog, Jack , and many other remarkable service/therapy animals, do each day. Jack gives the piece two paws up. Me, too. Find 4 Paws for Ability, which provided the service dog in the story, here. Photo of my Wonder Dog, Therapy-dog Jack, by Judy Winter 2012. (Therapy Dogs International). Nothing like a little controversy to get the special needs juices flowing. That's what New Mobility magazine has generated with their cover of Artie Abrams from Glee as its Person of the Year. For starters, Abrams is a fictional character on the ever-popular program, Glee. He's portrayed by able-bodied actor Kevin McHale, who's become a teen pop-phenom in a role that many actors with disabilities feel should have gone to someone with the cast member's disability. In short, many believe that casting of such roles with able-bodied actors takes away the too-few opportunities to make a creative living by actors who live the realities of disability each day. I believe that's the harsh reality. On the other end of the discussion is the reality that the role, regardless of who's in it, has generated huge awareness and discussion and perhaps greater understanding and acceptance of those with special needs by the millions of viewers watching the show each week, and that's priceless. So what's your take? Should a television actor without a disability who's portraying someone with special needs be honored in this way? Does Abrams/McHale's performance and the attention to the subject matter warrant such recognition, or does this choice add fuel to the justification of taking away key acting roles from those with real disabilities? Weigh in. Raise your voice and write the editors of the magazine and tell them exactly what you think. New Mobility editorial staff admits that their intention was to rattle cages and create controversy with their choice of the cover teen. Special Note: Lauren Potter's role of Becky Jackson on the Glee has also become a phenom. Potter plays a character with Down syndrome, a disability the actress has. I've been asked to put out the word for casting for the new Kate Winslet/Josh Brolin film Labor Day (Paramount Pictures), based on the New York Times bestseller by Joyce Maynard. Here's the brief scoop. There's a role for a teenage boy, age 12-17, with cerebral palsy and an intellectual disability who uses a wheelchair. Filming will be next summer on the East Coast, so the gig will not interfere with school. Find out more here, but act asap. Deadline is February 14th. Major studio/film/director. Major stars. An actor with the disability in the required role. The White House has announced a nine-city disability tour this spring to address disability issues regionally.